Available Space: 660 sq. ft. 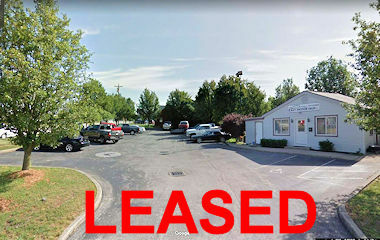 Attractive former used car lot with a free-standing retail/office building with a large paved lot for cars located on the corner of Burlington Pike (KY 18) and Oblique Street in Florence, KY. The building has 660 sq. ft. on the first floor with a full basement. The HVAC is provided by a newer Tempstar gas, forced-air furnace with central air. The building has great visibility on KY 18 with an existing 5’x8’ metal double-faced sign. 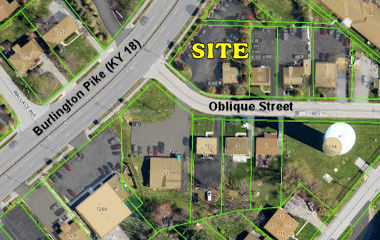 This corner lot has easy access to KY 18. Property is near Boone County High School, Remke Supermarket, Turfway Plaza and close to the I-75 Exit at Turfway Road and the KY 18 Exit. The current Commercial 2 zoning allows for most retail and office uses. Information submitted herein has been obtained from reliable sources. We have no reason to doubt its accuracy, but it is not guaranteed by First Commercial Realty, Inc. Copyright © 2017 First Commercial Realty, Inc.. All rights reserved.